Add a 16×2 LCD display to a micro:bit | Blog My Wiki! I had one of these cheap 16 x 2 LCD display modules hanging around that I bought to go with some Arduino or Raspberry Pi project that I never finished – in fact I couldn’t get the thing to work at all. I used this project as the basis, which includes a Python program to drive the display (registration required). You don’t need to download MicroPython to program a micro:bit, you can use the online editor – the beta Python editor will even allow you to flash programs straight to your micro:bit over webUSB if you’re using Chrome. I tried driving the whole thing off the 3v supply on the micro:bit, but it didn’t work – I think you really do need an external 5v power supply as there has to be a bigger difference in voltage between the power in and the contrast pin (although perhaps someone can do something clever with this information?) I didn’t have one to hand, so I chopped an old USB lead in half, and stripped the wires back to get 5v off the red (positive) and black (negative) wires, which I connected to the +ve and -ve (GND) rails on my breadboard. Normally you’d use a potentiometer to adjust the contrast, but I just used a 1KΩ resistor instead. It would be nice if someone made an adaptor to allow you to plug one of these common LCD modules straight into a micro:bit, with a USB input for 5v display power, maybe back-powering the micro:bit with 3v? Now what else shall I do with it? Show received radio messages from other micro:bits, make another Little Box of Poems or other random fact dispenser? 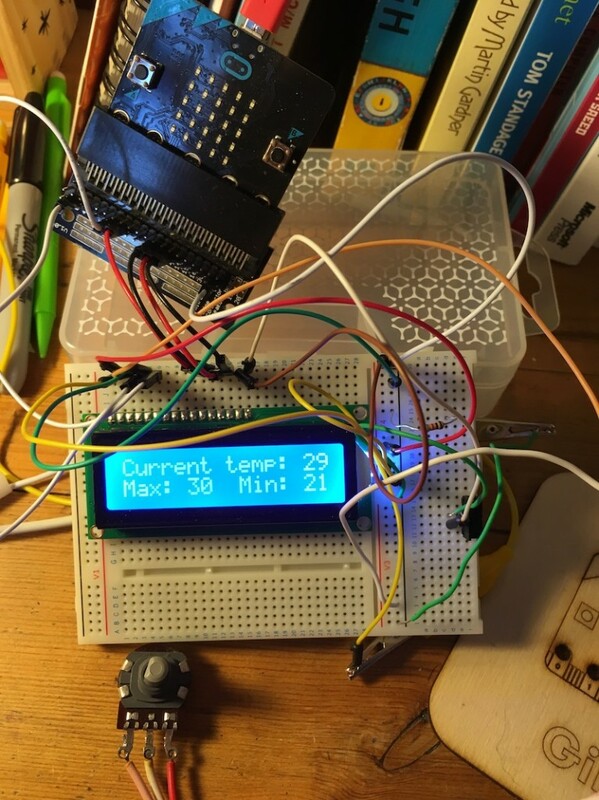 This entry was posted in microbit and tagged LCD, Microbit, Python. Bookmark the permalink.